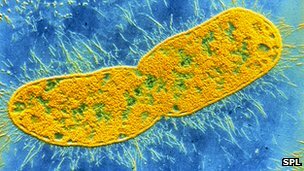 Klebsiella pneumoniae’s double cell wall means it is resistant to many antibiotics. Watch Susan Watts’ full report on the fight against drug resistant bacteria. This story gives a scary insight into how bacteria is growing and evolving, faster than our treatments that are meant care for our bodies! Having a movement disorder that constantly means our body fights itself, makes our immune system constantly low. Therefore we are at fear of picking up many of the bugs going around all the time. On a bus, a train, a tram, in a taxi, from any hand rail or door handle. Germs and bacteria are everywhere, just waiting for our hand to collect it. Even washing hands regular does not mean we are fully protected, and there are more and more hand gels being brought out onto the market everyday to fight bacteria. This story shows that try as we might, the bacteria are beginning to win. If something isn’t done quickly, it will end up that antibiotics become of no use to anyone. I commend our researchers, and all the time put in from all the medical staff and scientists out there working together to look after us.